I wasn’t always a dog lover, I used to be absolutely terrified of them. I would literally beg Mum to cross the road if one came towards us or I’d run in the opposite direction if one came towards us in a park. A reaction that only sent the dog running after me thinking I was playing with it instead of running for my life. I remember being about 8 years old and on our annual holiday to New Romney Holiday Village, sitting on a blanket outside our chalet playing with my baby sister Emily, who would have only been about 10 months old at the time. Our carefree moment was soon interrupted by a dog running and barking at top speed towards us and I reacted the way I always had… I ran away inside leaving Emily laying on the blanket with this mutt pounding around her. Screaming for Mum, she came rushing outside and was immediately livid with me for running off and leaving my baby sister to fend for herself. That moment of pure and utter regret has never left me and it’s up there on a long list of ‘what I would do differently if I had the the chance’ moments. I never imagined that one day we would somehow talk ourselves, particularly Mum, into getting a family dog. Then in 2008, after a lot of thought, research and visits to registered dog breeders, we brought home our Old English Sheepdog, Molly. She is without a doubt one of the best things that ever happened to our family. But most importantly she taught us how to love dogs and to not be afraid of them, whatever their size and shape. When starting a search for Molly, there was never a question of going anywhere other than to a licensed breeder. 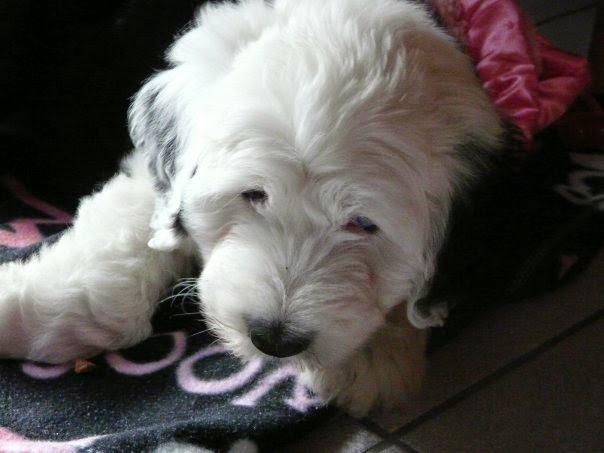 She came from a loving home, where her mother was well cared for and a breeder who was passionate about rearing Old English Sheepdogs in a safe and loving environment. It’s hard to believe that dog breeding would be carried out in any other way. But sadly this isn’t always the case and there are so many dogs who aren’t as lucky as Molly, her brothers and sisters and most importantly her mother. 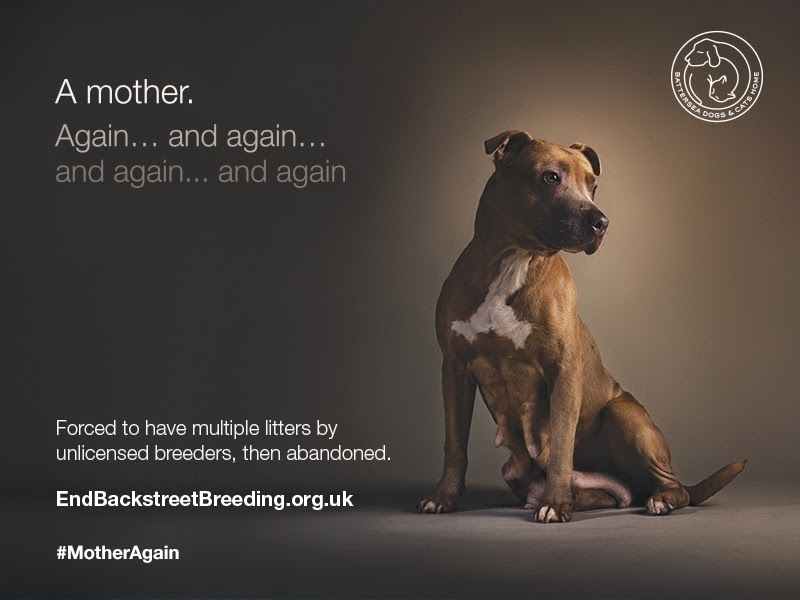 So when I received details from Battersea Dogs Home about their recent campaign to put an end to backstreet breeding, it touched a nerve with me and I just couldn’t ignore it. Giving birth, whether you are a human or an animal can be a traumatic experience and when this natural process is abused, the implications are unbelievable and simply horrific. Across the UK, unlicensed breeders are forcing female dogs to be mothers again, and again and again. Her puppies are usually wrenched from her before they are properly weaned and then forced to have more before her poor body has had a chance to recover from the previous litter, leaving them physically and mentally damaged and exhausted. More often than not these dogs are poorly treated and then abandoned when they are no longer fit for use. Their puppies, having not been cared for properly are sold with untreatable health or behavioural problems which are a result of their cruel and neglectful overbreeding. Battersea Dogs Home are working hard to put an end to backstreet breeding whilst dealing with the frequent arrivals of these neglected mothers who arrive on their doorstep, abandoned, bearing physical and mental scars from their heartbreaking experiences after giving birth to countless litters in such cruel circumstances. You too can help the campaign by writing to your local MP or simply spreading the word using the #MotherAgain and campaign website endbackstreetbreeding.org.uk. But most importantly, if you’re planning on buying a dog this year then make sure you visit a licensed dog breeder to ensure that these horrid humans aren’t profiting from something that is causing such pain and agony to these helpless animals. This blog post is in support of a charity campaign, therefore no monies have been exchanged.